FOX BIOLOGY: The Red Fox (Vulpes vulpes)is a fairly small canine, about 2.5 feet long and 8-14 pounds. It can vary in color, from orange to gray to silver or black. Females bear one litter of pups per year, and the number of young and the time of year can vary quite a bit depending on latitude and conditions. Fox average a lifespan of three years, but can live up to twelve years in captivity. COYOTE BIOLOGY: The Coyote (Canis latrans) is about three feet long and 20-40 pounds. They are primarily grayish-brown. They breed once a year, in late winter or early spring, and produce a litter of young that can vary widely in number. They can live up to ten years in the wild, or twenty in captivity. FOX & COYOTE BEHAVIOR: Fox are solitary animals. They live in dens. They establish a home territory, on which they hunt. They primarily eat rodents such as field mice or cottontail rabbits. Coyotes are similar, but they sometimes eat larger prey. They will eat a wide variety of foods, and will often scavenge. Coyotes are very adaptable, and will often live in urban areas. Both are mostly nocturnal. NUISANCE CONCERNS: Fox are known for raiding chicken coops and killing poultry. Other than that, they're relatively harmless. They're mostly shy and secretive animals. Same for Coyotes, although they can kill larger prey. 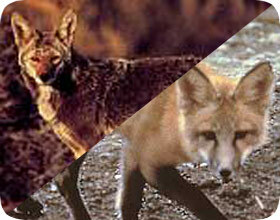 FOX & COYOTE DISEASES: Both can carry rabies, just like any canine. Beware of any wild animal that displays unusual behavior, such as lack of fear, inconsistent walking, etc. HOW DO I GET RID OF FOX & COYOTES? The best method is trapping and removal. 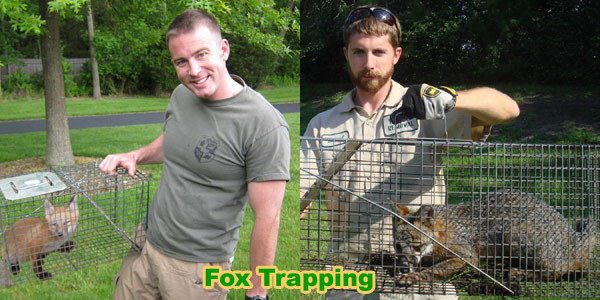 Many wildlife control specialists excel at canine trapping. In many areas, it's a lost art, since not as many people fur trap as in ye olde days. However, many nuisance trappers have learned to adopt the fur trappers' techniques in order to catch these animals. Some wildlife operators are in fact former (or even current) fur trappers. There are many techniques, some of which I consider inhumane, and some of which are antiquated. For more information, read my how to catch a fox page. CAN'T I JUST USE A REPELLENT? There is no known effective repellent or deterrent device to keep fox or coyote off of a property. Click here for a nationwide list of 100's of professional coyote trappers serving all 50 states. My Response: I don't think leash laws pertain to coyotes. Anyway, coyotes won't attack and eat your children in the night. But if the animals concern you, you can hire a professional trapper of of my wildlife removal directory. My Response: You can try fox urine, and if that doesn't work, just hire a trapper off of my directory. are fox dangerous to people or pets?